The HS-1 offers the excellent performance for technology transfer activities, research and development with a 0.45m² shelf area. Easy recipe development: quality and adaptation of the temperature sensors (shelf, product and condenser) and vacuum. 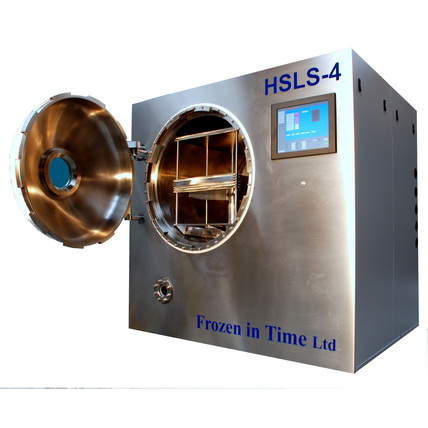 Temperature, pressure, time control and recipe optimisation capability. 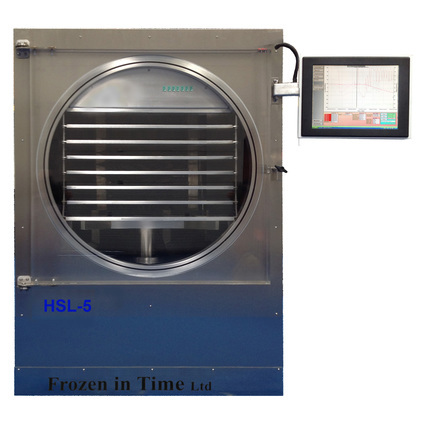 The HS-1 is the -55ºC version and the HSL-1 is the -85ºC. This lower temperature range is much more suitable for working with biological samples or products with very low eutectic or collapse points. The HS-2 is the next size up. Both sizes as standard come with micro processor manual control panel that can be automated via PC software. 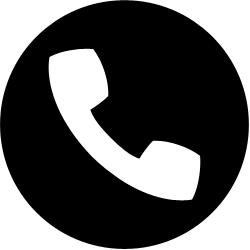 This allowing programing of automated recipes and data logging. As mentioned above this model comes standard with the same control system as the HS-1. Both these size ranges can be ordered with fully automated touch screen controls. 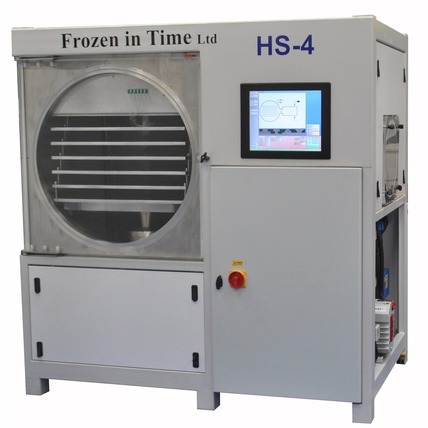 Ideal for like for like scaling up to production freezedrier control systems. This will include automated valve operation and automated vial closing. Giving the possibility of initial vacuum test and pressure rise test with the isolation valve. The HS-3 follows on, both the HS-3 and the HS-4 come standard with fully automated touchscreen control systems. We guarantee: shelf flatness, high quality components, rapid shelf heating and cooling rates etc. Flexible use: high capacity for working with bulk materials, option to attach manifolds. Also different sizes and types of vials. Reliable operation: control system via Omron PLC with a touch screen user interface. Option to save developed recipes and export data to other platforms (Excel, etc). Possibility to carry out optimisation studies for new formulae (scale up). 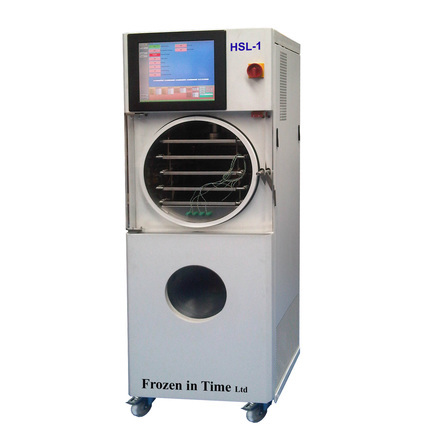 Each size is available with -85ºC refrigeration. There is the possiblility of adding extra shelves into the drying chambers if shelf spacing can be reduced. Each size is available with -85ºC refrigeration. there is the possiblility of adding extra shelves into the drying chambers if shelf spacing can be reduced. 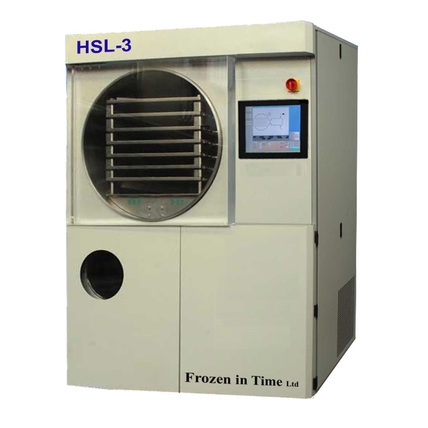 The HS/HSL range is also available with a steam sterilisable 316L stainless steel shelves and product chamber. With the same shelf sizes as the standard HS/HSL range the steam sterilised models are ideal for use in medical and biological applications where contamination of the product between processes must be avoided. Using steam at a pressure of 2.5bar and 135°C ensures the internal surfaces are sterilised effectively. Flexible automated PLC control through a SCADA touchscreen interface allows for easy setup of production recipes. Please contact us for more information, we can build to your specifications. 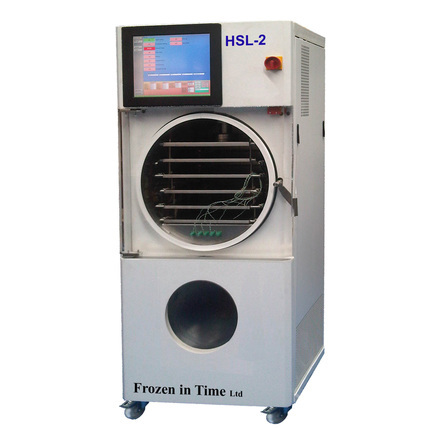 General purpose, high performance pilot freeze drier, featuring the same temperature controlled shelves as the HS/HSL-1 but without hydraulic vial closing. 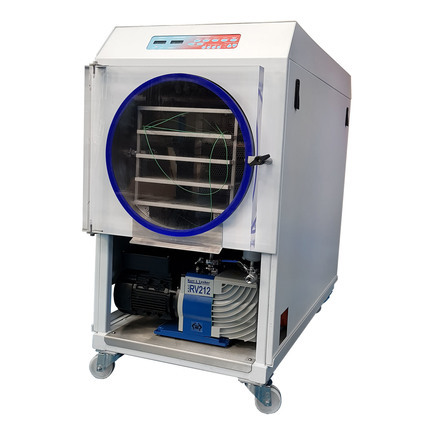 Easy to operate and in a smaller and lighter form factor than our other pilot units, the Multidrier Extra is an excellent choice for small scale production and product development.